I must admit, this is a very hard topic for me to discuss. 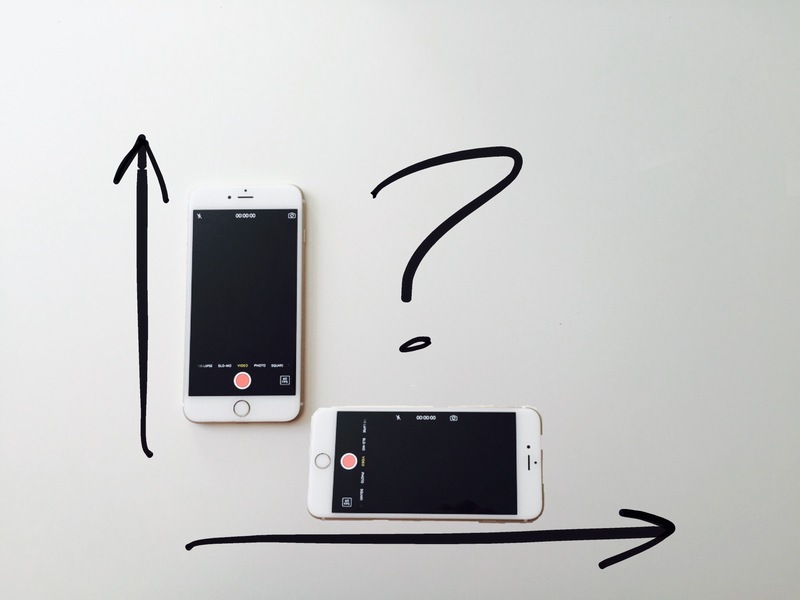 Go ahead, ask me what my impressions were on vertical videos, say, six months ago as I was leading a workshop on best practices for iPhone and mobile video capture. Me: Interrupting the nice man, “Get out of my class”. That dialogue is a fictional (of course) representation of how I might have responded to someone asking me for suggestions on how to take better vertical/portrait styled videos. I wouldn’t have thrown them out of my class, I just would have shamed them in my mind for being technically naive. Six months ago, I didn’t believe in these long and tall videos that looked silly on my tv, I would never dare to try and watch any of them and I certainly wouldn’t take any. In fact, there were a few instances when in my haste to capture a moment, I would neglect to set my phone correctly, thus accidentally begin recording a vertical video (oh, the horror). Upon realizing my egregious error, I was incensed, it was as if my phone had a virus and I was scrambling to delete the vertical mistake as fast as possible. I’m not sure when, but it was probably about the time Periscope began to gain momentum in the summer of 2015. For those of you who don’t know, Periscope, is a mobile streaming app that lets you watch live events in real time. Whether it is a celebrity such as Andy Cohen streaming live from his NYC rooftop patio or an average joe live streaming the Golden State Warriors beating the Cleveland Cavaliers in the 2015 NBA Finals, I was viewing this media in real time, right from my phone, vertically!? I think the part of my last sentence, “right from my phone” is the operative phrase here. You see, Periscope was being delivered to my iPhone, not my television. The format (at the time) was that to record a “scope” in portrait mode. I was evolving and didn’t even realize it. I have an iPhone 6 Plus. The content creators on Periscope such as Mr. Cohen or the fan at the Golden State game were delivering me information and media in the exact form it was created in..and it worked best when viewed vertically. Had I wanted to turn my phone horizontally, it wouldn’t have helped me, in fact, it would just make it less intriguing to watch. Well, Snapchat’s been around since 2011. Its original name was Picaboo and within the first few months of it being released, Picaboo had only 127 users. Don’t feel bad for Picaboo, later, co-founder Evan Spiegel renamed the struggling app to Snapchat and trust me, he and the app have been doing just fine ever since. By my use of Snapchat, I began to be drawn to acceptance of the portrait styled pictures and videos. Sure, you can take your Snapchats horizontally, but in the peer pressure sense, everyone else, even giants like ESPN, the Wall Street Journal and countless other major brands and celebrities, are quite happy with their snaps being seen vertically. So I began to respect the format and for the way these apps were constructed. It feels more natural anyway to hold our phone vertically. Even I can admit that when watching a YouTube video via my iPhone, the ergonomics of holding an iPhone 6 Plus can resemble the gripping of a steering wheel. Not to mention, I must find a place to rest one or both of my elbows. Vertical videos are always going to be less than ideal to watch on our televisions or laptop computers. But do a Google search on terms such as, “use of mobile devices”, “percentage of mobile users”, or “mobile websites” and you’ll see that most statistics label mobile usage at more than 50% of the population, and that is only going to rise. Here’s my point, we need to embrace the fact that you, me and the majority of others are scrolling their Facebook page, watching a video, or sending a Snapchat while naturally holding our phone in the palm of our hands. Am I going to quit shooting movies horizontally now? Of course not and neither will the news media and Hollywood producers. But I will be more apt to try to capture, say a portrait oriented 4K video of my kids playing golf (a perfect sport for vertically shot footage) and not hesitating to post it to my Vimeo page. Respecting the format is what led Snapchat influencer, Chris Carmichael to create the new Slinger app for iOS. It’s been well established that Snapchat lives in the vertical market, so Carmichael started Slinger as a way for Snapchat’s disappearing content to be curated on a vertically centered platform. Think of it as the YouTube for tall videos. And yes, after you run to the app store to download Slinger, look me up (JaWaViFilms). I’m creating Snapchat episodes to help people learn more about the mobile video experience. Where am I keeping those stories once they disappear on the Snapchat app? Slinger, and Vimeo, but Slinger is a much better way to view them in my opinion. Take that Vimeo. Earlier this year, as I became more active on Snapchat (username: jawavifilms), the comfort of actually filming content – vertically – took some getting used to. Still to this day, as I am recording a Snap, I look around, almost as if other people are judging me. There aren’t many, but be aware that some ole cranky thirty-something might very well be thinking that you have no idea what you’re doing. But, you’ll have the last laugh because he or she probably thinks Periscope is what you look through while on a submarine and Snapchat is a conversation they have with themselves when they realize their jeans don’t fit like they used to. The author, Scott Duvall is the founder of JaWaVi Films, a video and content marketing firm for small business based in Athens, Georgia. You can follow Scott on all social media (including Snapchat and Periscope) by searching for JaWaVi Films.